Travel, adventure and action are some of the words that come to mind when considering a career in photojournalism; however, hard work, persistence and the willingness to be away from home much of the time are more likely to describe the real life of a photojournalist. Photojournalism is the visual representation of a news story, so the ability to tell a story without words is the most important attribute of a successful photojournalist. Excellent camera skills are one group of tools a photojournalist must have, not just to tell stories, but to capture the story when it happens, which could be only a moment in time. Photojournalists must often shoot in chaotic crowds, dangerous environments or less-than-ideal photographic conditions, which require that they are able to operate their equipment almost unconsciously. The other group of tools a successful photojournalist must learn is the concepts and process of journalism. To tell a story journalistically, whether it’s with words or a photo, you must be able to describe the story with the traditional 5 W’s and 1 H: Who, What, Where, When, Why and How. Typically, a press photo needs the help of a caption to answers all these questions, but a photo a news editor accepts will answer as many as possible without words. If your goal is to become a photojournalist, then you start by acquiring the knowledge and education of the two groups of tools outlined above. A formal education is the best option, especially if you’re a young person. A successful photojournalist not only knows photography and journalism, but also is a student of history and current events. To capture the images that tell stories of today’s world, you must also understand the context of those stories: their place in history, how they effect the world, nations, the economy, readers, etc. A formal education at a traditional university provides the broad range of learning a photojournalist needs. 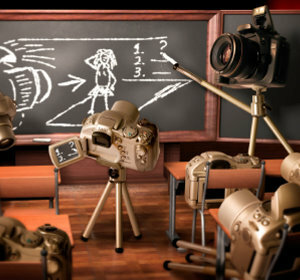 Another option is a photography school, such as the New York Institute of Photography, which offers a free course catalog at http://www.nyip.com/requestinfo/. If a formal education is not a viable path to becoming a photojournalist for you, then it is possible to self-educate yourself and gain enough experience to be hired by a publication or news service. It’s not an easy path, but it can be followed to success. You will still need to learn the photojournalist’s set of tools: photography techniques, journalism concepts and an understanding of world events. There are many resources to learn how to use your camera equipment like a pro: online tutorials, short courses at community colleges, local photography clubs, etc., plus plenty of practice. To understand what it means to be a successful photojournalist, then read the biographies or biographical information available online of the famous news photographers. Study their work and learn why news editors accepted their photos. Once you’ve tried a few of these mock photojournalism practice sessions, you could then approach local non-profit or community organizations and volunteer to shoot photos for their press releases. Ask permission to take a series of pictures of an organization’s director during his or daily activities, as if you were creating a “Day-in-the-Life” photo spread. Although sports photography is generally considered a separate form of photojournalism, ask any of the local children’s athletic leagues to allow you to photograph their games. You’ll gain useful experience about telling a story in photos, capturing a great image that only happens once and managing the process of covering an event. You could also approach local high schools and volunteer to shoot photos of their “lesser” sports. It’s likely a photographer from the local newspaper or a few “official” school photographers will cover the football and basketball games, but may not come to field hockey, soccer or volleyball games. With these experiences, you should have a portfolio of images to approach the editor of your local neighborhood/community newspaper for a part-time position or the opportunity to be an intern and work with the publication’s full-time photojournalists. You then may be able to establish a relationship with one of these working photojournalists, and ask him or her to be your mentor. Having worked with a pro provides you with an education you don’t usually obtain at a university and gives you a reference when you’re ready to seek a full-time position as photojournalist.